Can I add my logo and other images to the PDF? 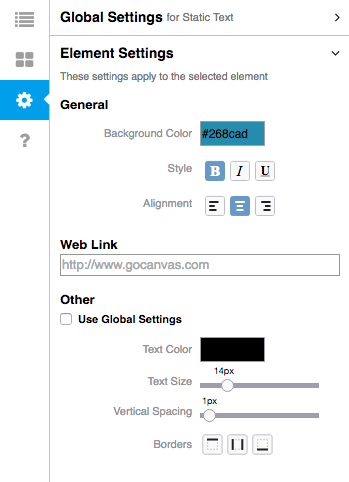 NOTE: This article refers to the GoCanvas PDF Designer. If you are looking to customize the Standard PDF, please click here. With the GoCanvas PDF Designer you can customize how your logo appears on the PDF output as well as add other static images. Launch the PDF designer by going to your Apps page and clicking the Edit PDF button. Add a new section to your design by hovering your pointer over a blank area in the designer. Select the Click to add Section option. You can also add images to existing sections or columns. Open the Elements tab in the left panel. 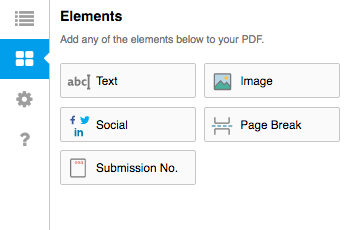 Drag the Image icon from the Elements tab to the corresponding section or column in your design. Once the image is added, the Settings tab will automatically load giving you the option to choose an image file from your computer or to paste a link to the image. If you would like to edit the vertical spacing between other the image and closest items or if you would like to add a border, deselect the Use Global Settings option. NOTE: By default images will fill the entire section or column. You can learn more about resizing images here. Can I add text and images that aren't in my App to my PDF? What are PDF Designer Global Settings? Can the GoCanvas PDF match or look like my current paper form? What is the PDF Designer?